I'm somewhat of an impulsive crafter. An idea will float in and it won't leave until I am able to bring it to life. Usually, my ideas germinate sometime between my head hitting my pillow at night and falling asleep. Often, it's difficult to settle down at night, because my brain is in overdrive. Can you relate? 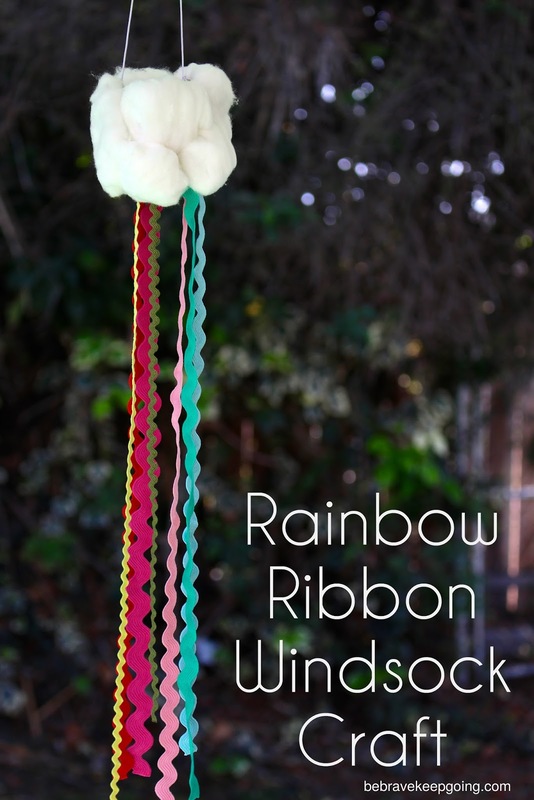 That's exactly how this rainbow ribbon windsock craft came about. I had purchased a pack of this adorable rickrack ribbon (also spontaneously) and didn't know exactly what I was going to use it for - but the colors made me happy. The ribbon sat and sat and sat in my craft stash until - boom! Late night idea that pops into my head and must. be. made. I had enough self control to wait until the next day to bring it to fruition. This rainbow craft is probably best for elementary aged kids. My daughter loved it and said it looks like "a puffy cloud with a rainbow "raining down." Several strands of rickrack and/or ribbon in a variety of colors. Using a hole punch, punch hole around the bottom edge of the TP roll. 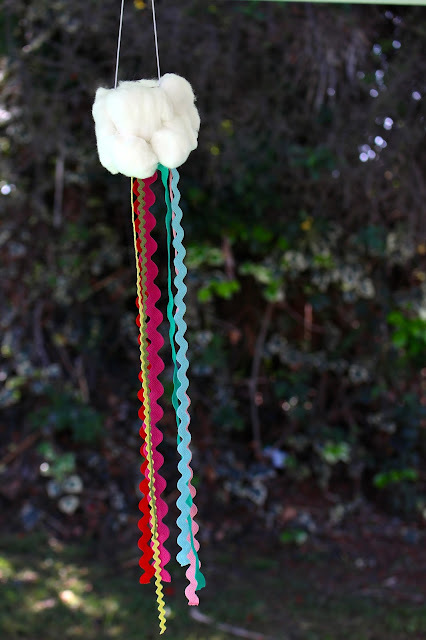 Tie your ribbon through each hole and let it hang down. Punch two holes in the top of the tp roll (used for hanging it up). Using the school glue, cover the tp roll with cotton balls. Tie ribbon or string through the two holes on the top and hang wherever you like!